The former Labor Temple at 222 Third Ave. S.E., photographed Thursday afternoon. Eleven years after it got involved with the former Labor Temple on Third Avenue, the Albany City Council this week ended the city’s role by voting to sell the building. The buyer of the 113-year-old structure (built in 1905, according to county records) is Sable Drive Inc., one of the companies managed by Scott Lepman, who has developed and renovated numerous apartment projects around town. The selling price was $375,000. Years ago the place housed the offices of one or more unions, and a sign out front called it the Labor Temple. It was in 2007 that the city got involved with what was then a dilapidated structure. 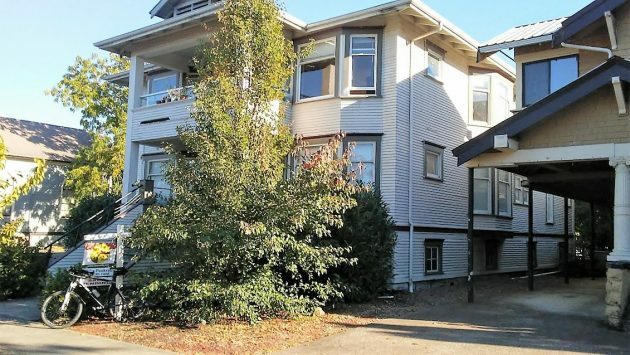 The Albany Revitalization Agency –meaning the city council — loaned an associate of the ill-fated Willamette Development Services $250,000 to renovate the building and build townhouses on vacant land next door. The project went nowhere, and the city got a judgment against the would-be developer in 2010. In subsequent years, starting in April 2009, ARA worked with other promoters and developers, and the building was outfitted as four apartments. ARA made additional loans and placed liens on the property. Finally, the city agency started foreclosure proceedings in 2015 and then became the owner of the building and landlord to the tenants. A rundown provided to me by then-CARA manager Kate Porsche (see how it pays to keep old stuff on your desktop?) showed that all together the agency had liens on the property totaling $355,000. This represented the amount of CARA money the city had sunk into the project. 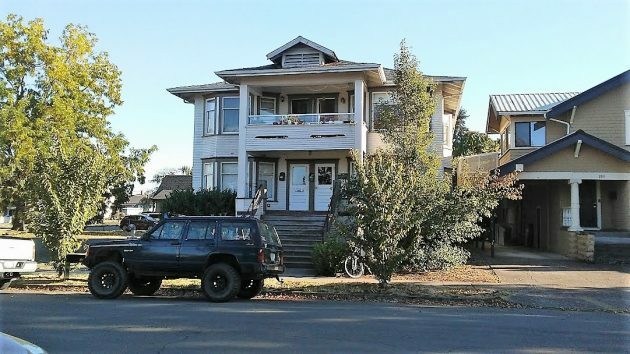 The city has been receiving rent payments from the tenants, and now with the sale for $375,000, it looks as though the city didn’t lose anything on this venture. The Lepman organization also owns the vacant lot just east of the Labor Temple. It had plans to build housing there, but those plans were connected to the CARA-assisted restoration of the Fortmiller Building on the west side of Third Avenue, and their current status is unknown. The view of the building from across the street. Why is the City intent on underwriting every scheme that has to do with old, dilapidated buildings, dumping hundreds of thousands into crumbling edifices, yet the City won’t expand Albany Transit System. Certainly making it easier for folks to get to work and back on mass transit is as important as buying fixer-uppers that occasionally break even. Those same workers pay the taxes that underwrite CARA and all other City-sponsored efforts. These are two separate programs. CARA, our Urban Renewal program is designed to fix up run-down, dilapidated buildings that result in urban blight and loss of downtown property values. The BORROWED money that CARA lends is paid back by the increased tax values that the up-graded buildings generate. Our bus system is supported largely by federal moneys allocated for that purpose. CARA money can’t be used to support the bus system. Apparently Councilor Olsen would have you believe that CARA is the primary cause of increased property tax values in the CARA area. I call BS on Olsen. It is a logical fallacy when a claim is assumed to be true without evidence other than the statement or claim itself. I remember challenging Kate Porsche several years ago to provide supporting data on a chart she presented that implied CARA was responsible for the entire increase in tax revenues over a specific time period in the CARA area. She couldn’t do it. The reality is there are many causes of increased property tax revenues. Nobody can show how much, if any, is attributable to CARA. But that doesn’t stop the CARA folks from intentionally trying to deceive Albany taxpayers. Wake up folks, you’re being played.